Yoursites123.com is one of those browser hijackers that are both annoying and useless. It is also categorized as a PUP (potentially unwanted program) by virus experts. Being a browser hijacker, the threat is not classified as a virus. Nevertheless, it can still cause damage to your system if you do not remove Yoursites123.com as quickly as possible. The browser hijacker can show corrupted search results, and this exposes your device to a wide variety of online infections. The most notable thing about this PUP is the changes that are done without your direct permission. This means that your default search provider, new tab page, and homepage are all gone for now. You will only be able to see Yoursites123.com in their place as long as you do not delete the threat. Luckily, it is not a very difficult task. If you acquire a reliable anti-malware and anti-spyware application soon enough, the hijacker will be eliminated and your computer should not suffer any consequences. The potentially unwanted program is not that dangerous on its own. After all, it is not, for example, a dangerous Trojan horse that continuously downloads malware as long as it is on your PC system. You can get infections only if you use the hijacker. You have to know that even though the invader might look beneficial to some users (it displays a lot of links and shortcuts related to sports), we do not recommend using it. The moment you start browsing, you can notice that something is wrong. The results are not really legitimate (although they are borrowed from yahoo.com). Third-party sponsored links can be displayed at the top of the results and you may click on them, even by accident. The links might redirect you to sites that are not only useless, but also extremely dangerous. Hackers corrupt some pages in order to spread viruses, and you might end up on such a site. Moreover, non-personal info like IP addresses or search history is collected. This is done to produce various ads. Uninstall Yoursites123.com so that these and similar problems would be avoided. How did my computer get infected with Yoursites123.com? 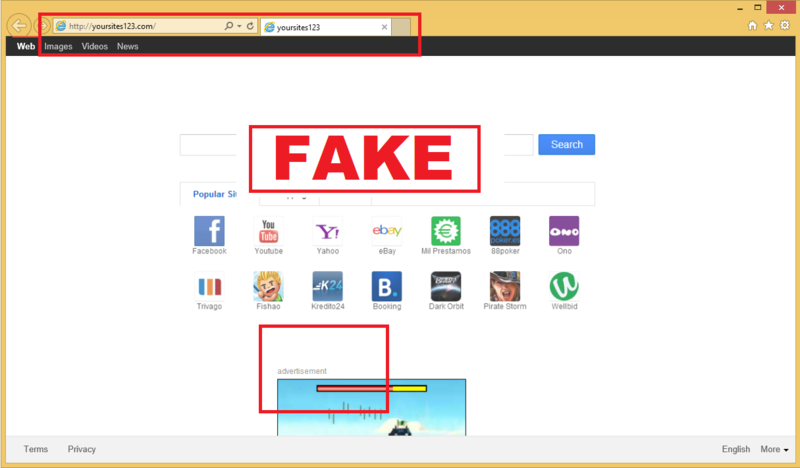 You have probably acquired the browser hijacker accidentally while downloading free software. Our team advises you not to use file sharing pages if you want your computer to be safe at all times. In addition, you have to download a legitimate anti-spyware and anti-malware tool. When installing any free software, pick the Advanced or Custom installation type so that you would not have to delete Yoursites123.com and similar applications anymore. How to remove Yoursites123.com from my computer? Yoursites123.com removal is an easy deed to do with the help of a reliable malware and spyware removal tool. Simply scan the PC with it and wait until the program erases the invader. Of course, you can also do this manually by resetting the browser, but automatic termination is much more reliable.